With its pine-finished interior walls and ceilings, this chalet makes a nice and cozy retreat. Whether you are catching the ferry early in the morning or spending a few days exploring Tobermory’s many attractions, our two-bedroom chalet provides a wonderful accommodation experience. This two-bedroom has a fully-equipped kitchen, one queen size bed in each room, a pull out sofa in the living room, and four-piece bathrooms on both floors. It is located on a quiet street just steps from town for a high-quality stay no matter how long your visit. All of our cottages and suites are non smoking and pet free. 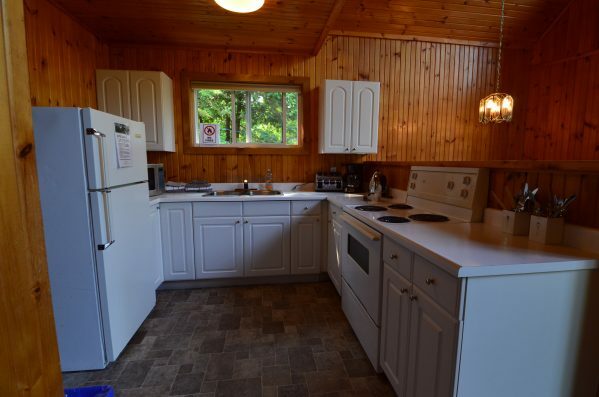 All cottage and suite rates are based on four people, each additional person is $20/night regardless of age. On long weekends Sunday or Thursday night would have the same rate as Friday and Saturday night. The rates posted below are approximate and are subject to change. For exact room pricing, please use our Book Your Stay booking tool.